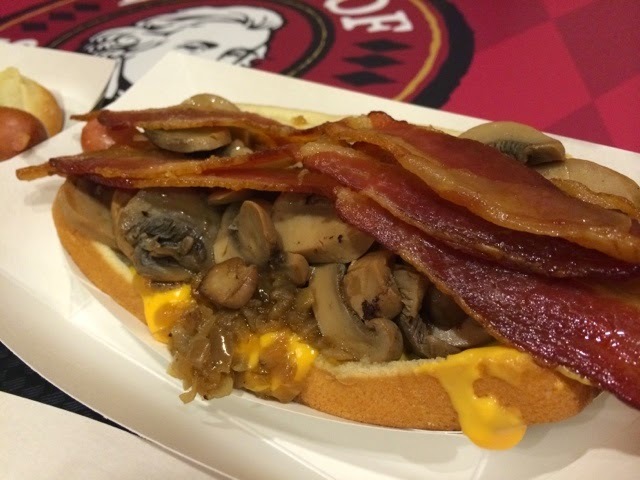 With that, let's talk about hot dogs, shall we?! The in-laws planned to stay a couple of nights at Harrah's Resort Southern California (formerly Harrah's Rincon Casino) out (way out) in Valley Center in October, so we went out to spend quality time with them. We arrived in the late evening to meet them and it was dinner time (my favorite meal). Harrah's has a nice range of dining options; their 24-hour eatery, The Cafe, Earl of Sandwich, Fortunes (a noodle place), 'Ritas Cantina, their buffet, an oyster bar, a fancy steakhouse, Starbucks, and... PINK's. Yum! Golly gee, the obvious choice for me was a Pink's hot dog. M and I haven't had Pink's since we visited the original location back in 2006, so I bee-lined to their counter (and everyone followed, haha). At this location, the prices are a bit higher than the original location in Los Angeles (ex: $4.85 vs. $5.99 for a 9" stretch chili dog), but I thought it was priced okay for what we get. All 'regular' dogs are 9 inches, unless stated otherwise. They also have limited menu items, but it was still a good selection of hot dogs, burgers, and sides. M ordered the Mullholland Drive Dog ($7.99). *insert emoji of the surprised face with big eyes here* It was topped with three strips of bacon, grilled onions, nacho cheese, and grilled mushrooms. Oh, it looked amazing. I didn't have a taste of his. There was so much on top, I couldn't even see the hot dog! 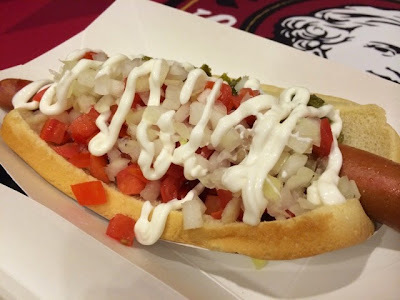 M's stepdad ordered the Guadalajara Dog ($5.99) with diced tomatoes and onions, relish and sour cream. He said it was "delicioso." He didn't say it in Spanish (that was all me). It looked really good, but these are not my type of flavors on a hot dog. 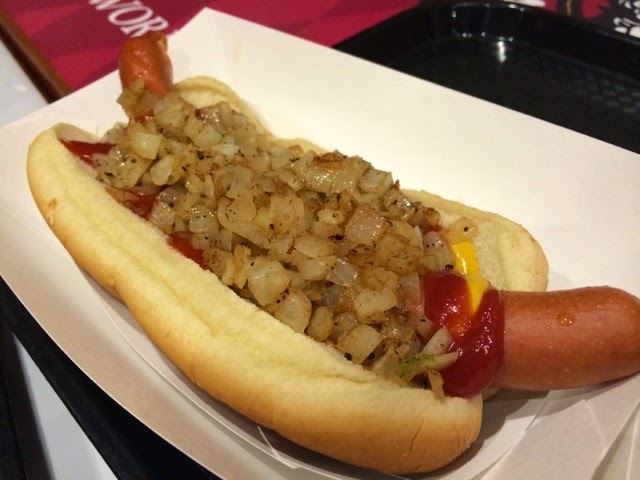 M's mom ordered a plain hot dog with ketchup, mustard and grilled onions ($5.99 + $0.99 for grilled onions). The onions looked yummy. They piled it on! Speaking of piling on... here's MINE! At the LA location, I had the nacho cheese chili dog and I remember it was so good that I had to have another one. 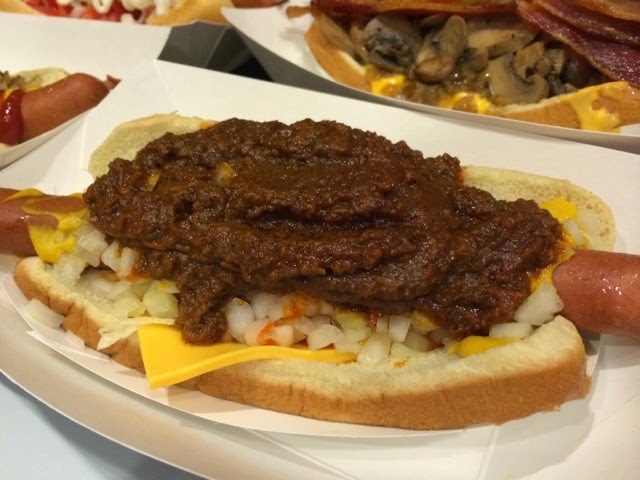 Only, I ordered the original Stretch Chili Dog ($5.99) with mustard, onions, sliced American cheese and meaty, yummy chili. I heart chili dogs. I really do. Especially this one -- the beefiness from the hot dog and chili was so delicious together, plus the crunch from the mild, diced white onion and the tang from the mustard made this chili dog one of the best hot dogs I have had. Ooh, if I order it with the grilled onions next time.... yes. 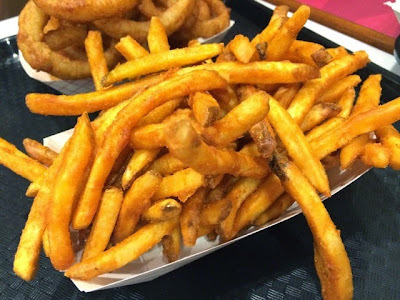 We all shared two sides to compliment our dogs: onion rings ($3.49) and french fries ($2.79). 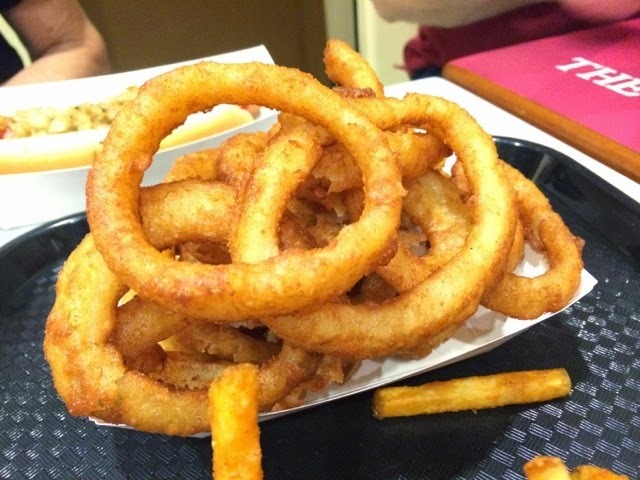 The onion rings were crunchy and had a nice ratio of batter and actual onion. They didn't seem like the frozen kind. Personally, I have always thought that fries belong with burgers and hot dogs and potato chips go hand-in-hand, but these french fries changed my mind. They are so crispy, seasoned perfectly and so addictively delicious! I couldn't stop eating them. They reminded me of Rally's fries, but crispier (not soggy) with more flavor. They went really well with my chili dog. Pink's Hot Dogs was a great treat. Driving all the way to Valley Center may be too far for a yummy hot dog, but if you're in the area for any reason, I would recommend that you check it out. 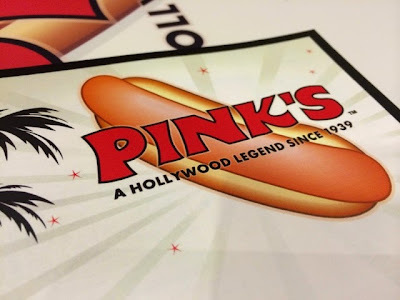 Here is the link to the Harrah's Pink's menu (PDF).